Sports And Safety – footsteps……..
Whatever we do in our everyday life, the safety aspect should be put as top priority. Once safety is breached, the consequences might be something that we do not want to see or hear. This also concern sports in every aspect. When I was lecturing on Competencies in Sports for the NSC’s Sports Science courses, the subject of safety is being repeated a few times. Safety of the exercises prescribed, safety of the equipment uses, safety of the environment and surrounding, safety of the athlete, safety of those people around. I always like to mention to coaches that neglecting safety procedures will invite injuries. For athletes, injury is the beginning of the end an athlete’s career. Even though he/she will recover, but the cause of the injury and the injured part will still haunt him/her which in turn affects performance. On 28th May 2013, the social media especially facebook was abuzz with another safety issue during the second leg of the FA Cup Semi Finals between Pahang and Johor at Darulmakmur Stadium in Kuantan. The match was however postponed. To me it was a well tackled situation not to proceed with the match. If the match were to have been played, I think more untoward incidences might have happen. The players are at stake. The supporters too will not be spared. This photo was taken from Astro Arena Saluran 801 Facebook account. From what was mentioned, said and read, the situation starts with supporters overflowing onto the track and a JMT supporter was hit with some object which was said to fly in from outside the stadium. It was the unhappy fans who was not able to enter who did it. When spectators flow onto the track, it was a wise move by the organiser to abandon the scheduled match to another convenient time and maybe place. Abandoning is one thing, what about the spectators who had bought tickets and spent their time to be at the stadium. Worst still are Johor supporters who came in buses, spent their monies but was not able to witness the match. 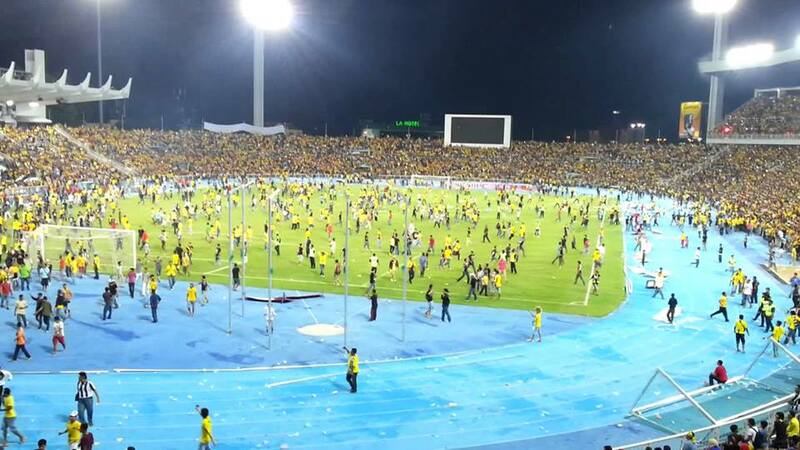 With what that had happen at Darul Makmur Stadium, it seems the fans are becoming fanatical. We have heard that Kelantan supporters had at one time turn rowdy due to them unhappy at official decisions. It is hoped that organisers, FAM and State FAs will have their brain burning to find ways to solve the uprising fanatics of the fans. Its easy to control a few individuals but when they are in thousands, we should understand that the task is very difficult.